Here is what I’m doing with my wild and precious day today: spending as much time as I can with the girls. My youngest is home from a month as Leader-in-Training at camp; my oldest has a few days off before returning to camp for the rest of the summer as a counsellor. As they get older, our time together is more precious than ever, and I intend to make the most of it. What are you doing with your wild and precious day? Arrange four salad plates on the counter. Combine the orange juice, lemon zest, thyme, balsamic vinegar, garlic and a pinch of salt in a bowl and stir well. Transfer 2 tsp of the dressing to a small bowl. To this small bowl, add the olive oil and a pinch of salt. Toss the lettuce with this mixture. Combine the roasted beets with the remaining dressing. Lightly scoop a quarter of the lettuce with your hands and put it on a salad plate. Add a quarter of the orange slices and a quarter of the beet slices on top. Sprinkle a little salt over each salad. 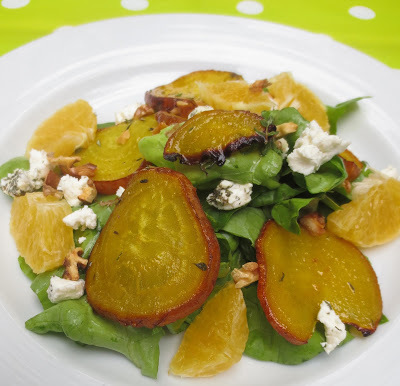 Crumble the goat cheese and sprinkle evenly over the salads, then do the same with the walnuts. Serve right away. Preheat the oven to 475 degrees. Line a large sheet pan with a piece of parchment paper. Put the beet slices in a mixing bowl and toss thoroughly with the olive oil. Arrange the slices, evenly spaced, on the sheet pan (it’s okay if they touch). Sprinkle with thyme and salt. Roast until the beets are tender and glistening, 16 to 18 minutes. The smallest slices will be black around the edges. Let cool for a few minutes before serving. I'm crushing on this salad too! I've been enjoying having Nick home from college this summer…it will be strange to have him leave us again in just a few weeks. Your salad sounds incredible…I'm going to have to roast some beet slices…such a novel idea! I love it all, the poem, the salad and that you are spending time with your girls. Enjoy, time slips away before we know it. I adore beets of all shapes and colours. I love beets but prefer the golden beets since IMO they're sweeter. Your salad sounds like the perfect blend of flavors. Beets and goat cheese are my favorite. Nice salad! How interesting that the poem only focuses on a day, not your whole life or big dreams, I love that! The small things. The salad is so original Beth! Great poem! Great salad, too – I love beets in anything, but they're so great in salads, particularly when roasted. Really good stuff – thanks so much. Yummy looking dish! I just finished spending a week with our oldest grandchild. We are now off to Chicago to see her younger brother get baptized. 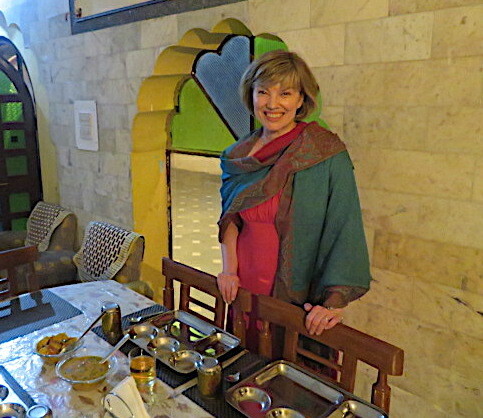 We are Mormons–batism is a big thing–we couldn't miss it. Life is good. Children grow fast, relish every moment–this i know. So true that the time slips away. That's why I'm enjoying all the time driving my daughter around this summer. Thanks for the great recipe. I'm still thinking about the blueberry one. Savor every moment with your children, Beth. They grow up so fast. I love the poem AND the beet salad. Today, I am heading out to spend the day in the country–savor the fresh air and work in a good friend's garden. 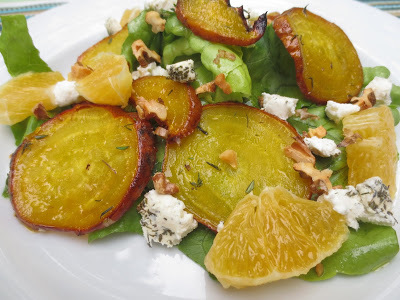 What a beautiful salad Beth, The golden beets with orange looks delicious especially with the goat cheese…indeed a very summery dish. I love that poem – and the sentiments it conveys. It sounds like you're taking full advantage of your girls' company 🙂 I also love the look of this dish! 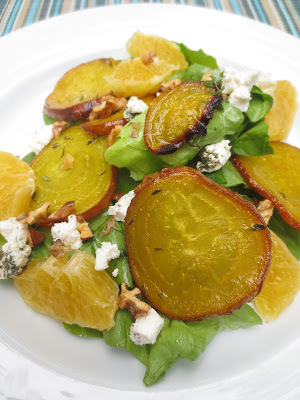 Beth, what a lovely poem and wonderful summer salad – the colors are oustanding and the recipe sounds amazingly delicious – to my great disamy, I cannot ever find yellow beets around here. Enjoy the wonderful time with both your daughters! I took my kids to Color Me Mine today. They have pottery there and you paint it. It's a lot of fun and it keeps the kids (and me busy for a few hours). It's our special us time together. Going to farmer market tomorrow and I need to get some golden beets! Your summer salad looks divine, Beth. beets, grr! i want so badly to like them but so far, i've never eaten a preparation i found particularly tasty. I'm really really trying to like beets! This salad is just so pretty! The roasted beets looks delicious ! I love roasted beets! I didn't know you could roast then until last year when we grew more than we needed in the garden and I needed new ways to cook them. Love that sweet summer poem. Oh, my. I do love Mary Oliver. Such an amazing poet. The salad looks wonderful, too. I really need to get fancy with salad. I usually just do the same stuff each time. This one would be good, though! Just discovered your blog when blog hopping.